Understand LED Lamp "Rated Life"
LED lamps are different to Incandescent, Halogen and Fluorescent lamps. These older technologies base their life declarations on average rated life at 50% survival (this is a legal European requirement under IEC 60064). This has been the standard approach for some time and does not take into account the amount of light those lamps emit, only the number that survive to a certain point. Click here to purchase LED lamps. However, the semi-conductor industry has always rated LEDs differently, and since the recent boom in LEDs for mainstream lighting there has been some confusion over these differences. Megaman is now seeking to clarify its position for its ranges and categories of lamps. 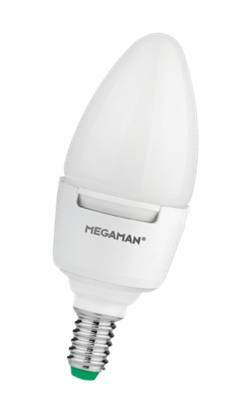 Currently Megaman offers an Economy LED Series and Professional LED Series in the UK. The rated life as shown on our product packaging may say 25,000 hours for the 6W GU10 reflector for example. This would be the L90 value, the L70 value being 50,000 hours. The “L” values represent the rated life at the point in which the lumen output falls to the declared level. For instance, a figure of L70 50,000 hours means the average point in hours at which the lamps will have a 30% reduction in light (i.e. 70%) output is 50,000 hours. L90 25,000 hours means that at 25,000 hours light output would be expected to fall by 10%. Note that this does not relate to any failures. For survival another term “F” is used. Again for clarity 50,000 hours L70 F50means at 50,000 hours there will be a 30% drop in lumens and 50% of the lamps will have survived. Clearly it is therefore possible to have lamps where several different life levels (L) are quoted and they may all be correct. For instance, it is possible to have an L50, L10 and L35 (and any other level) rated life. It is also important to realise that the rated life (as shown on the lamp packaging) is just a guide and the levels are average figures determined at an ambient temperature of 25oC in open fixtures. When lamps are operated in enclosed fixture (for example fire rated fittings in the UK) these levels may change in accordance with temperature and the operating parameters and you should seek further advice. For clarity please call us for the appropriate “L” value for the lamp in question.